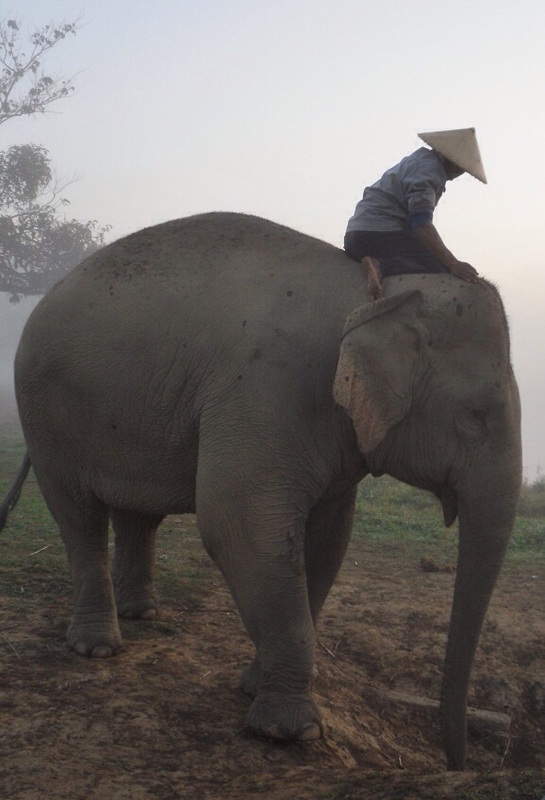 The bond between the elephant and the mahout is strong and lifelong. It wasn’t gorillas in the mist, it was elephants. The first early morning encounter with these gregarious giants on the misty banks of the Mekong River was breathtaking. 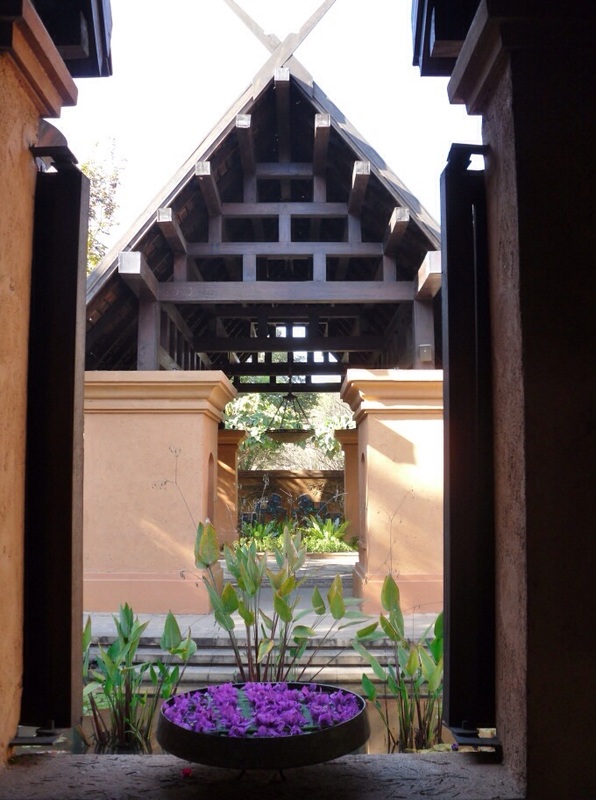 Anantara Golden Triangle Resort and Spa, located 74 kilometres from Chiang Rai Airport, was the perfect choice for a four night stay to complete a tour of Northern Thailand. 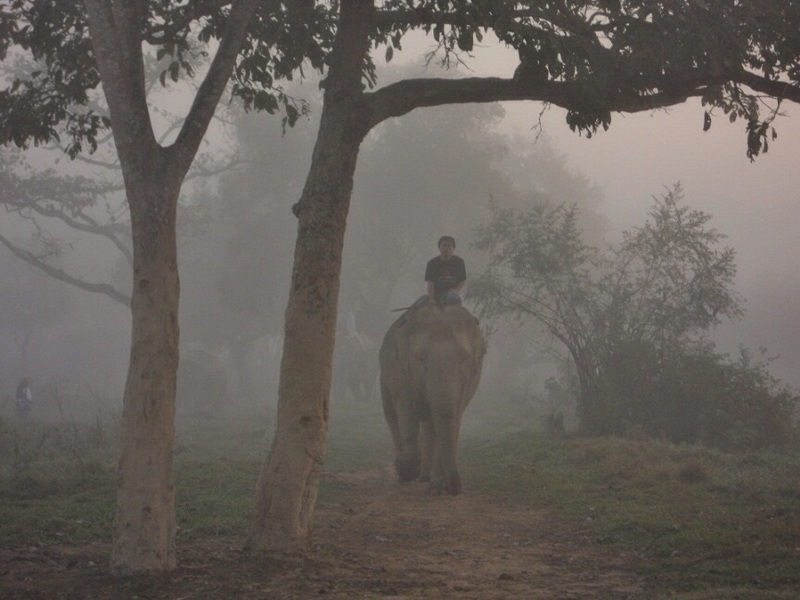 A unique integration of an elephant sanctuary (Golden Triangle Asia Elephant Foundation) and a 5 Star luxury resort provides unprecedented opportunities to interact with the magnificent, lumbering monoliths in their natural habitat. The view from our second floor room overlooking the elephant valley was an awe-inspiring invitation to partake in all the hotel had on offer. Although others might prefer the hotel car option, we chose the free hotel bikes to ride down to the valley. So began our tropical jungle adventure. 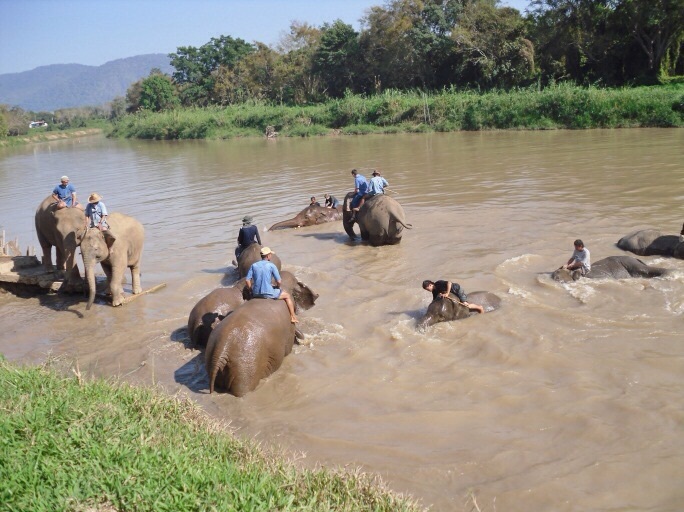 In the early afternoon we watched the family of elephants ease their huge bulky frames into the muddy river to wash away the toils of the working day. The lumbering figures emerge slowly out of the thick morning mists. 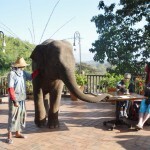 Each animal and their mahout played host to guests wanting to experience the thrill of riding, controlling and befriending them. Entering the river aboard an elephant’s back, the wails of joy and trepidation from the apprentice ‘tourist’mahouts, matched the shrieks of hilarity from the true ‘master’ mahouts (mahout – a person who raises and takes care of an elephant for almost its whole life) as they looked on and orchestrated the whole clumsy manoeuvre. No wonder they insisted on a change of clothes for the uninitiated. With the daily bathing ritual complete it was time for the elephants to be set free for the evening to wander the valley and rest. 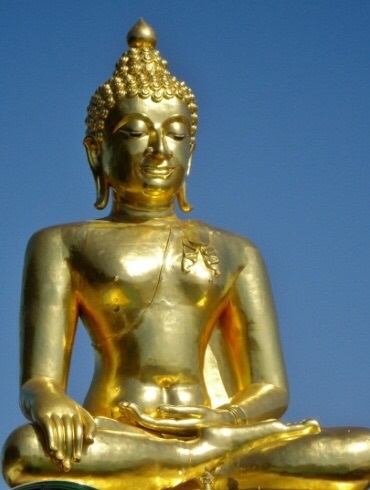 Riding the bikes to the local village, we discovered the majestic yet gargantuan, golden budda sitting serenely guarding the juncture of the three Asian nations; a place which lends itself to either sombre reflection or great photo opportunities. We followed a trail of ubiquitous souvenir shops, food hawkers and local produce stalls to arrive at the long tail boats. From here we took a short ride on the river from the Thailand side to Laos and Myanmar, sightseeing and more ‘same-same but different’ shopping. We decided to pick up hands of tiny sweet bananas; little‘gems’ to offer the gods. Back in our hotel room, the enormous stone bath with orange blossom and cardamom oils beckoned a ceremonial immersion in preparation for dinner. 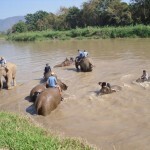 The elephants love to splash around during bathing time in the river. 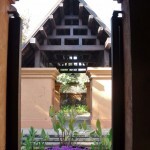 The exotic beauty of northern Thai architecture and gardens. Playful Mena greets hotel guests every morning at breakfast time. Strolling along the path to the restaurant, the garden whispered its exotic secrets; dollops of ginger amidst a serenade of wild jasmine. Descending the hotel staircase to the traditional northern Thai dining room, a welcoming ‘sawadee kap’ was offered and we reciprocated with a novice gesture of joined hands and a dipping of the head. Sala Mae Nam serves local Thai cuisine with stunning views, a wide selection of fine wines and highly attentive service. Of course for those seeking an alternative, the Baan Thalia (Italian Dining) offers guests a more western fine dining option. The evening would not be finished without a nightcap (or two) in the Elephant Bar during the late night happy hour. Other guests had already assembled by the huge log fire which hissed and crackled in the oversized hearth surrounded by a collection of elephant polo memorabilia. Here we met Carol Stevenson, a photo-journalist, known as the ‘Elephant Photographer’, who has a passion for these beautiful creatures and a long association with the Foundation. She endeared us with her endless stories about filming in the wild and capturing candid, playful moments, her life-time love affair with elephants and especially her favourite ‘Meena’. She spoke of how the Foundation had rescued elephants from the streets of Thai cities and their remarkable journey of resilience in times of great hardship until eventually finding this sanctuary in the jungle of northern Thailand. Her best photos are taken in the evocative, ethereal mists of the early morning light. And so began our next adventure. The valley below appeared still sleepy under a doona of white, downy fog. The bike ride to the meeting place was icy and exhilarating. There Carol waited for us and gestured towards the open field beyond. Slowly the giant shapes began to emerge from the miasma of the morning mist, like a film-noir screenplay. 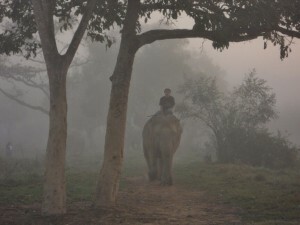 The stillness was finally broken by the trumpeting of great trunks, heralding their arrival. Our meager offerings of tiny sweet bananas were swept from our hands and disappeared into grateful, gurgling bellies. The day had begun with something so incredible, it would be hard to top this experience. The majestic figure of the giant, golden Budha signifies the junction of three nations. 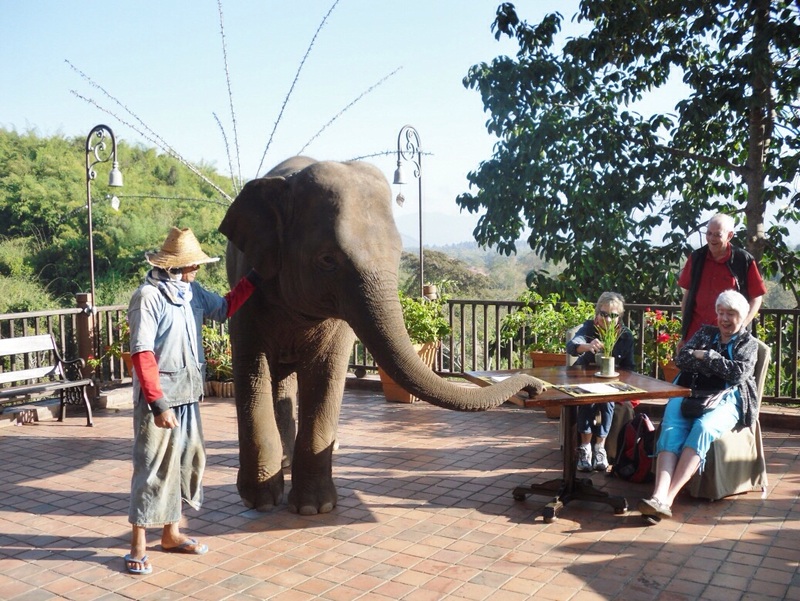 Returning to the hotel for breakfast we were greeted with the sound of “Good Morning, Good Morning, Good Morning’ as Meena and her fun-loving mahout entertained the guests on the terrace with their well-rehearsed welcome. Decisions had to be made. Would it be a tour of the fascinating Opium Hall, a short bike ride down the road, or would we settle for the deep fried ‘big fish’, a local delicacy on offer at the riverside restaurants? Maybe we could do both. One decision we would not have to make; we would definitely be returning to the ‘valley of the kings’ in the morning to see those imposing titans materialize from the haze and once again enthrall us with their gentle gait and gracious presence.